One of his final exhibits was “Volcanos and Full Moons,” a survey of his work last year at the Oceanside Museum of Art. To San Diegans, Silva might be best known for “The Rain House,” his installation at the New Children’s Museum, a colorful creature-covered playhouse featuring the sounds of rain. Silva’s critiques of student work were incisive and encouraging, said filmmaker Jean-Pierre Gorin, professor of visual arts whose tenure at UC San Diego coincided with Silva’s. Among his most popular classes were studios in painting and drawing. 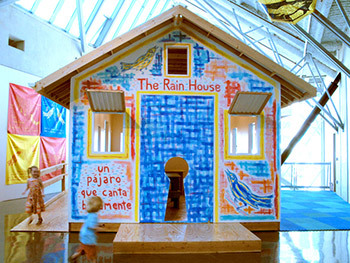 Ernest Silva’s “The Rain House,” 2008-present, at the New Children’s Museum in San Diego. Silva’s art captured an innocence that appealed to a wide audience, but also held depths of meaning revealed to viewers who took the time for close examination. 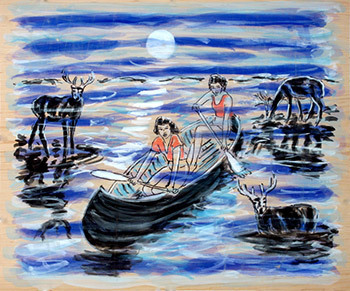 In a series of paintings in the early 1990s, Silva depicted a deer on a raft afloat on blue water that reflected a full moon. Reviews of Silva’s work appeared in Arts magazine, ARTnews, the Los Angeles Times, the San Diego Union-Tribune (now UT San Diego), Art in America and many other publications. 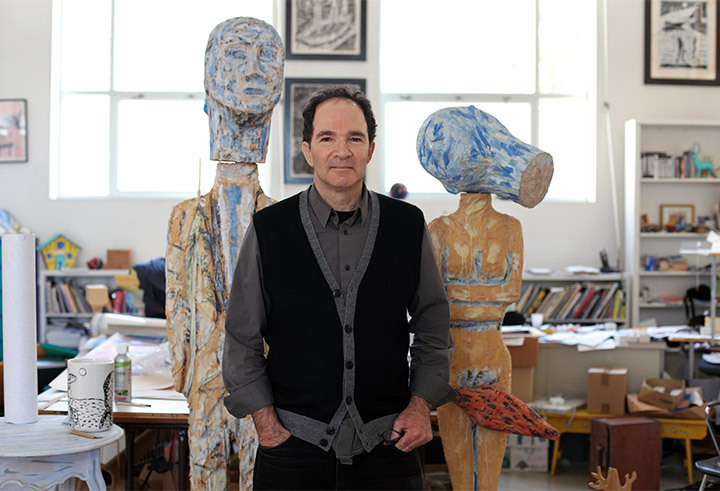 He received a National Endowment for the Arts (NEA) Fellowship in Painting in 1989 and an Excellence in the Arts Award from the University of Rhode Island in 2001. Silva’s work appeared in “Made in California: Art, Image and Identity 1900-2000” at the Los Angeles County Museum of Art. Silva was a co-creator, along with San Diego gallery owner Mark Quint, of “IN/SITE 92,” an exhibition of site-specific art in San Diego and Tijuana as well as exhibits in galleries, bookstores and museums. “In the Night,” 2009, by Ernest Silva. Silva was born Dec. 11, 1948 in Providence, R.I. He earned a bachelor’s of fine arts degree from the University of Rhode Island and a master’s of fine arts from Temple University’s Tyler School of Art. Silva’s work was featured in more than 50 solo exhibitions and at least 200 group shows, at museums and galleries in New York City, Chicago, Los Angeles and many other American cities, as well as in Italy, Denmark, Mexico and other international locales. Silva is survived by his wife Susan Silva; two stepsons, Marcus and Vaughan Mabee; his 93-year-old mother Theresa Silva; sister Ann Casey; and brother Ronald Silva.